After labor costs, the second biggest expense retailers face is credit and debit card fees. That’s why Liberty has made it a priority to contract with one of the most responsive, efficient vendors in the nation—Heartland Payment Systems—for our merchant processing program. At the same time, we haven't been bashful. We've used our collective purchasing power to lock in excellent rates that are substantially better than those offered by the major oil companies, resulting in greater savings for our distributors. These low rates not only protect your bottom line. They can enhance your price competitiveness at the pump. 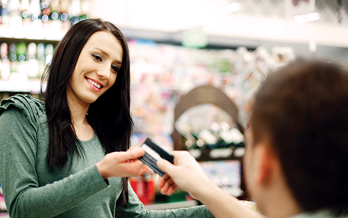 Credit cards are processed at a transaction fee of $0.0450 plus interchange pass-through. Pin debit settled transactions are processed at a transaction fee of $0.0450 plus pass-through (network fee, Pulse, Nice, etc.). Enjoy Liberty's low payment processing fees. "Liberty's credit card program provides me with the most competitive rates in the industry. Bottom line, Liberty provided a beautiful patriotic presentation and provided me the peace of mind to price competitively with anyone on my street daily." "Choosing Liberty as one of our suppliers has been one of the best decisions we have made. They have turned out to be a great partner."